With a handful of U.S. midterm election results left to be declared the Democratic Party has taken control of the House of Representatives while the Republican Party has retained control of the Senate according to Axios data. A period of cohabitation over the next two years may make life more complicated for the administration of President Donald Trump in implementing trade policy, but may not make a significant difference to final outcomes. Arguably the most significant piece of trade policy, and the one that is least likely to change because of the midterms’ results, is the escalating tariff war with China. 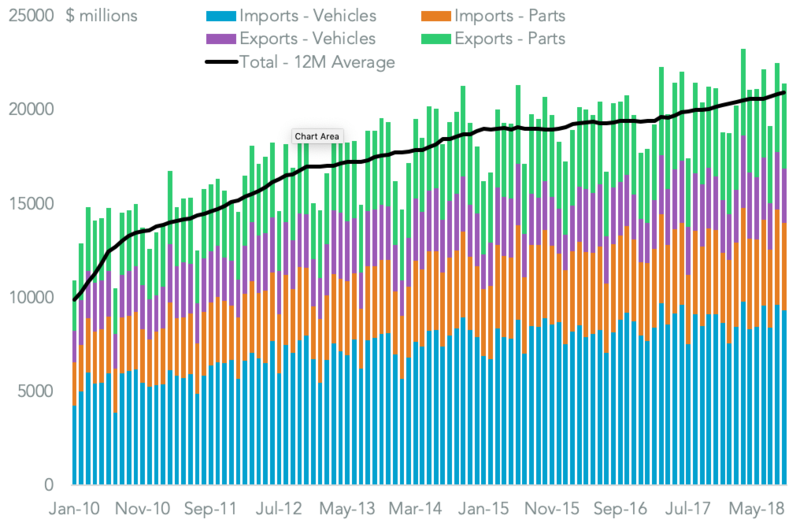 Panjiva data for U.S. imports and exports shows that U.S. trade with China accounted for 16.1% of total trade in the 12 months to Sept. 30, making it the third largest counterparty after Mexico / Canada and the European Union. As outlined in Panjiva research of Oct. 25 bilateral tariffs applied under the section 301 process covered $360 billion of trade as at the end of September at rates of between 5% and 25%. Short of radical changes to underlying legislation it is difficult to see how Congress can easily remove the President’s power to continue prosecuting the trade war. 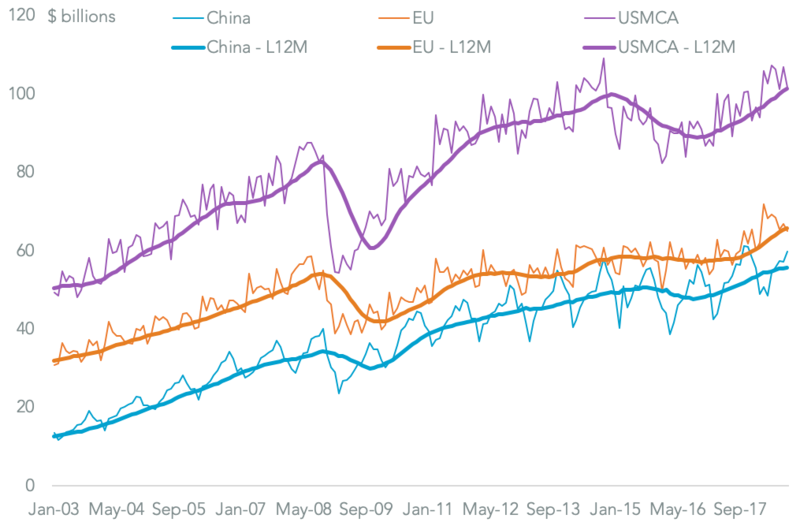 A rapid decline in U.S. exports to China, and resulting economic downturn, could change the Senate calculus of course. With all that said, the forthcoming summit meeting between President Trump and President Xi, scheduled for Dec. 1, will be more important. An approval of the U.S.-Mexico-Canada Agreement (aka NAFTA) will likely be put to Congress in the new year. Under Trade Promotion Authority both houses can only either approve or reject the deal. The Trans-Pacific Partnership deal brought by the Obama administration in similar circumstances was successfully blocked by the Republicans. However, President Trump has repeatedly indicated that he would be willing to withdraw from NAFTA under the right circumstances. House Democrats therefore run the risk that blocking the deal may result in greatly expanded economic uncertainty. Additionally the labor-friendly terms embedded in some of the rules of origin will be attractive to many Democrats. Should USMCA passage be blocked or delayed though the greatest uncertainty would likely way on the automotive industry (parts and vehicles). In total the industry accounted for 20.6%, or $251.0 billion of America’s bilateral trade with Canada and Mexico in the 12 months to Sept. 30. The automotive sector already faces uncertainties from the section 232, “national security” review of the industry. 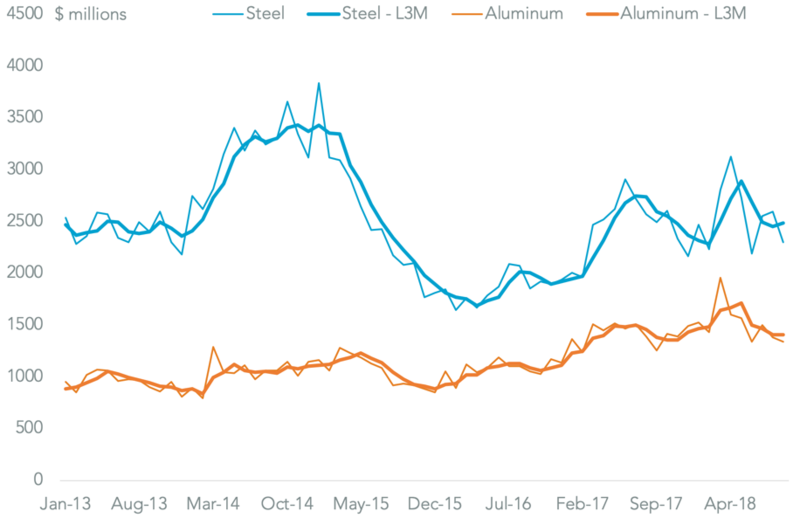 The application of duties under a similar scheme has had only a marginal impact on the steel and aluminum sectors – U.S. imports fell by just 7.0% in dollar terms vs. the second quarter and by just 1.7% vs. the first quarter. The automotive sector review has proven more controversial however – it isn’t clear what the national security issues around automotive industry are. While the makeup of the House Ways & Means Committee (which covers taxes and tariffs) will change, and could be more hostile, new legislation seems unlikely. Several bills to restrain the President’s use of section 232 have been introduced in the current term, but none have made much progress. It’s difficult to see any making progress in the next Congressional term given a veto-proof majority (two thirds of votes in the Senate) would be needed. The section 232 review is also hanging over the administration’s putative trade negotiations with Japan and the EU. Assuming the TPA rules are followed the main impact of the change in control of the House may be an insistence from Democrats on the imposition of strict labor standards in new trade deals. 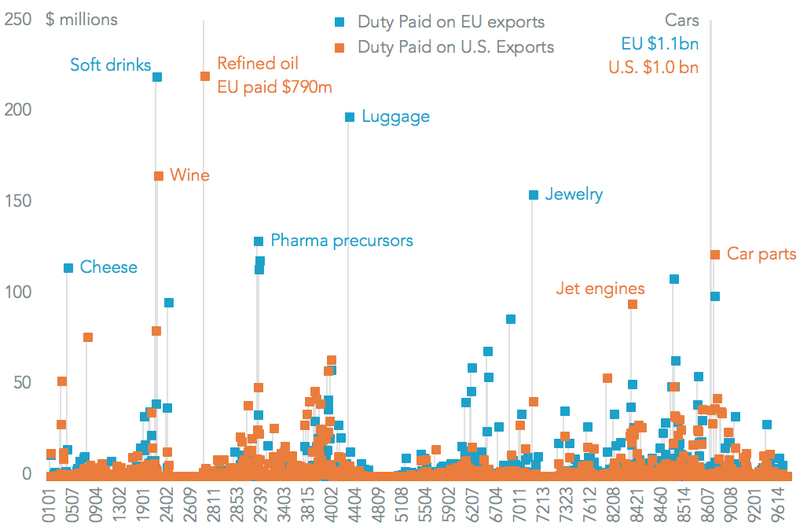 Trade deals with the EU and Japan will likely focus more on standards and non-tariff barriers than tariffs. Yet, there are still significant wins available with $12.4 billion of bilateral tariffs with the EU and $4.1 billion with Japan. In any event those deals will take years rather than months to negotiate and so may be a matter for after the next elections in 2020. This report was first published as Panjiva Research on November 7. To learn more visit panjiva.com/research.